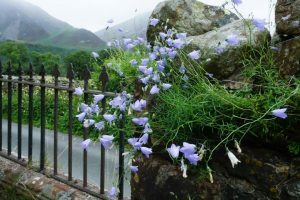 The hedgerows are lovely at the moment with meadowsweet, honeysuckle and harebells and earlier this evening I went for a walk through Loweswater churchyard where there were some beautiful harebells, growing out of the wall. Certain things always happen at particular times of year but you tend to forget about them until they happen again. The other morning I woke to the unmistakable bleat of a desperate lamb in the field in front of Foulsyke with its head stuck in the wire fence! The lambs reach through for the tastiest blades of grass but are not aware their horns are growing and they can’t pull their heads back again. In another few weeks their horns will be bigger and they will not be able to reach through. I did however manage to free this one although what anyone passing would have thought of me in my pink dressing gown manhandling a sheep at 7 o’clock in the morning I do not know! The other week Judy and I had an amusing incident when we went over to the Langdales. We were sat quietly on the top of Pike O’Blisco enjoying the views when we were suddenly surprised by the sight of a lady doing a headstand in front of the cairn! We chatted to her once she was the right way up and apparently she is doing headstands on the top of all the Wainwrights – this was her 163rd. Unfortunately I did not have time to get my camera out! 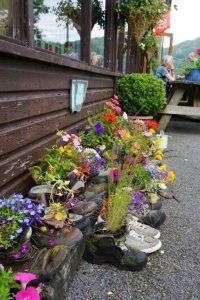 Thinking of things that have made me smiIe recently, I came across an interesting re-use for old walking boots at Borrowdale Youth Hostel. Very often with photographs it is being there at the right moment. 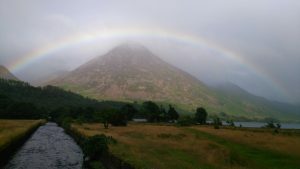 I went for an evening walk down to Crummock a couple of weeks ago, it was grey and drizzly so I didn’t take my camera with me but when I got down to the lake the sun came out briefly and there was an amazing rainbow positioned directly over Grasmoor – I did however have my phone with me!